The Home of Christ Church in Saratoga, Calif.
A former elder of a Saratoga church and his wife have been indicted by a federal grand jury in San Jose on charges of defrauding the church and a wealthy foreign donor of $7.4 million. Jonathan Chang, 60, and Grace Chang, 57, of Cupertino, were accused in a nine-count wire fraud and money laundering indictment issued under seal on Feb. 4. The indictment was unsealed Monday after the couple made initial appearances before a federal magistrate in San Jose and were each released on bonds of $200,000. 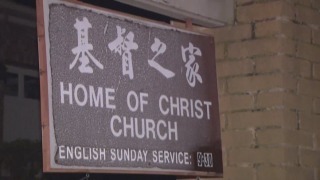 Jonathan Chang was formerly an elder of the Home of Christ Church 4 in Saratoga from about 2002 to 2011, with responsibility for managing the church's finances, according to the indictment. Grace Chang assisted him with correspondence and other tasks, the document said. The Saratoga church is one of six Bay Area branches of the nondenominational Home of Christ Church. The other branches are located in San Francisco, Menlo Park, Fremont, Cupertino and Newark. The charges against the pair include one count of conspiracy to commit wire fraud by bilking the church and a foreign donor, identified only by the initials C.W., of a total of $7.4 million between 2004 and January 2016. The indictment alleges that Jonathan Chang set up a supposed charitable foundation called Home of Christ Associates, or HOC Associates. The couple allegedly then deceived C.W. into believing the supposed foundation was associated with the church, and deceived the church into believing it was the same as a genuine foundation established by C.W. The couple allegedly diverted a $2 million donation and $3 million loan from C.W. for a new church building, $1.5 million in other donations from C.W. and $900,000 in church funds to the supposed foundation and then used the funds for their own benefit. The indictment also charges both Changs with four counts of wire fraud for transfers of money made from C.W. in Taiwan to an HOC Associates bank account, one count of conspiracy to commit money laundering, and three counts of money laundering for transfers of funds from the HOC Associates account to accounts they controlled. Each count carries a maximum possible sentence of 20 years in prison upon conviction. The Changs are due to return to the court of U.S. Magistrate Nathanael Cousins on Thursday for identification of their defense lawyers and a further bond hearing.